Jernau Gurgeh is a professional Player of Games, to the extent that anyone in the far-future Culture may be said to have a profession. Pan-humankind, alongside a plethora of sentient machines (including giant space ships with such wonderful names as So Much For Subtlety and Unfortunate Conflict of Evidence) has plenty of tech and no shortage of anything. This poses an obvious obstacle to writing a novel, since no sensible person in the Culture is likely to want anything badly enough to generate a novel. 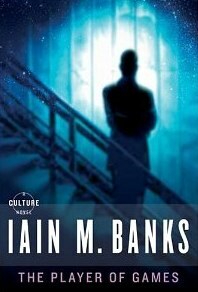 Iain M. Banks overcomes the difficulties with style, starting with the introduction of a sentient machine – the wonderfully unpleasant Mawhrin-Skel – who was created to be a soldier-diplomat, turned out to be entirely unsuitable for the job, but who very badly wants his old job back. Banks also sets himself a ghastly task – writing about a man whose passion is playing complex chess-like games of many sorts, all impossible to describe – and acquits himself well. To me, "software craftsmanship" is a pub where a certain crowd of talented, brilliant and passionate programmers hang out. Back in the late eighties and early nineties, they hung out in the "Object Oriented Arms", which had great real ale and comfy chairs. But the OO Arms got overrun by consultants and salesmen in suits who all stood around drinking expensive cocktails and talking ignorant crap in very loud voices, so the crowd started drinking in the "Patterns Bar" a few hundred yards down the high street. Via Torill Mortensen, Bergen has a breeding pair of oystercatchers who are brooding on camera. 10 саветаў па напісанні вэб жыццё. My 2001 Ten Tips for Writing The Living Web, translated into Belorussian by Galina Miklosic. I seem to have misplaced one of my own publications. Our dreams and devices will continue to pace, and occasionally outpace, each other. The future of serious writing lies on virtual surfaces richer and more malleable than paper, and these questions will better inform our understanding than nostalgic longings for an imaginary past, for the smell of ink and leather. It’s struck me as odd for a while now that my community has been so complacent in the face of the ongoing destruction of Ashkenazi diaspora cuisine. Border disputes and high politics aside, the State of Israel simply doesn’t carry the torch for the actual heritage of American Jewish families in this way. In other words: Lots of falafel, no pastrami. His solution: food trucks! You wouldn’t need to subsidize them forever, I think – seed capital will do. Dave Winer offers a list of tech ideas to tech incubators, asking only that people who decide to implement his ideas tell him and, if things work out, give him a chance to invest. I’m quite fond if Iggy’s bagels myself, and nothing beats homemade pastrami. London Tinderbox Workshop: May 28. J.Nathan Matias, Alex Strick van Linschoten, and Mark Anderson. I came across this lighthearted – but far from superficial – book in a Kensington bookstore last year. I didn’t buy it then, thinking I wouldn’t really want to carry it around all day, and that perhaps it was a momentary whim. It stuck somewhere in memory, though, and – wonders! marvels! – the public library has a copy. So here we are. Plenty of people are Sunday painters, Fry observes, and we all think that playing an instrument is a nice thing to do for fun. Why not verse? 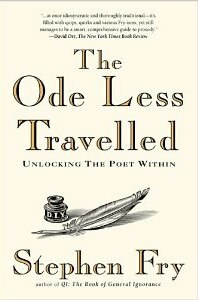 Fry takes a look at the nuts and bolts of writing poetry, especially using very traditional forms for comic effect. Want to write an amusing sestina, or dash off a memorable ballad? Fry is your guy. Stian Håklev offers an intriguing proposal for a graduate student’s knowledge workstation in a screencast mashup of Papers, Skim, Devon Think, and Tinderbox. I think we’re far better off accepting occasional nuisances in order to be able to mix and match smaller, more interchangeable tools. Want to use Acorn instead of Photoshop? Fine! Swap Papers for Scrivener? OK! Want to try FreeMind instead of Tinderbox today? Go right ahead. Besides, if you can put up with occasional context switches and perhaps write some scripting glue, you can have almost all of this today without waiting for someone to build it for you. Håklev’s screencast is a great example, however, of clearly showing what one might want to do, and why. This is indeed the trickiest part of the craft of software. Guess Mueller’s image editor Acorn was recently trounced – well, mildly tut-tutted – by a formerly-significant computer magazine because it’s not Photoshop. This never happens to big companies, presumably because they might be big advertisers and because software reviewing on the whole is so inept that nobody notices petty corruption. Software is the great art form of our age, and we treat it less seriously than children’s music or food writing. Ebert’s review observes that the excellent recent remake of the movie adheres closely to the novel, which Ebert clearly admires. Clive Sinclair, writing in the Times Literary Supplement, reminds us that Portis’ story of a 14-year-old girl’s vengeance is a Vietnam novel, a tale of 1968. 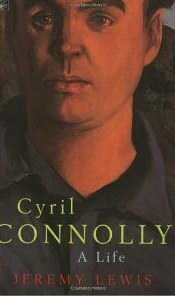 The film makes an interesting double feature with Apocalypse Now, and the book is not out of place beside “Heart Of Darkness.” Conrad was interested in evil, and in the contrast between London businessman and the jungle; Portis accepts evil, like discomfort, as a bothersome burden that a sensible person should oppose when possible, just as one ought to dispatch a rattlesnake if you have a sharp hoe ready to hand. Portis’ judgment of the war is sound and subtly argued: Rooster Cogburn has fought in wars before, and will go on to fight in wars again. He is a good man. 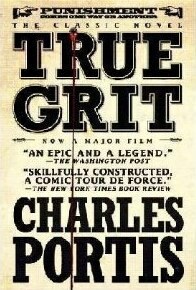 He has true grit. And he has always, always, found himself fighting to the bitter end for the wrong army. I make a point of seldom linking to the Electronic Book Review, but Stuart Moulthrop’s For Thee: A Response to Alice Bell and review of Bell’s The Possible Worlds of Hypertext Fiction , repays attention. Moulthrop gets off to a slow start, but eventually he arrives at some fine and carefully-argued points. and urges us to take steps to escape the niche. Moulthrop’s rejoinder, argued carefully and wisely, is that many places worth being are niches. For Dr. Bell, the adjectival niche is a term of suspicion. I disagree, having learned to think of literary or cultural niches not as traps, but as necessary predicaments or premises. As I see it, if dwellers in these dens need to escape anything, it is the niche distinction itself, the overriding concern with separation of specialist and popular markets. Indeed, that numinous word market seems ripe for inspection. Granted, inspection can never lead all the way to categorical rejection, so long as we inhabit the neo-imperial metastate, or in literary terms, what I have elsewhere called Reagan Library. Markets exist ineluctably, perhaps as a condition of language, consciousness, or animal being, and the value of what we think and make continues to be set by their unseen hands. It would be disingenuous to claim otherwise while discussing a study that may help establish the value of hypertext fiction, a literary project to which I have long been committed. While I would suggest a different understanding of markets, one less concerned with dominance than circulation, perhaps more attuned to attention than capital, I freely concede that value is always a vexed business. Why do so many Professors of English spend so much time worrying about the popularity of new media? Folks: there are people who are paid to worry about what sells and what doesn’t. They are called, “the sales department.” They (we) are your natural enemy. These people are (sometimes) good at their work. It is their job, not yours, and they neither desire nor require your help. Your job is to figure out what is worth reading, and explain why. You receive more praise, not less, for finding merit in obscure and little-known work. Nobody needs a professor to tell them what is in the window at the bookseller or what they’re reading at Elaine’s. ‘See man for mine!’ replies a pampered goose. - Pope, An Essay on Man. Pope’s On Criticism is 300 years old this month. Dear e-server: please ditch the graphic backgrounds and consider some modern markup and typography. Setting poems inside <TABLE> tags is a little old-fashioned. Thanks. In fact, why not make a nice big poem like this, safely in the public domain, an example for modern Web typography? In this Pulitzer-winning novel, every chapter begins with a timeshift and a new point of view. 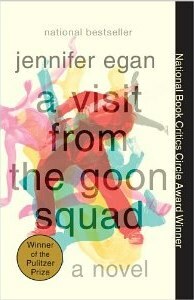 What might seem a tedious experiment in late postmodernism becomes, in Egan’s hands, a natural way to tell a complex, compelling story about the intersecting lives of a group of friends and acquaintances over the span of many years. He wants to grab his daughter’s skinny arm and yank her away from these black men, but does no such thing, of course. That would be letting her win. The warrior smiles at Charlie. He’s nineteen, only five years older than she is, and has lived away from his village since he was ten. But he’s sung for enough American tourists to recognize that in her world, Charlie is a child. Thirty-five years from now, in 2008, this warrior will be caught in the tribal violence between the Kikuyu and the Luo and will die in a fire. He’ll have had four wives and sixty-three grandchildren by then, one of whom, a boy named Joe, will inherit his lalema: the iron hunting dagger in a leather scabbard now hanging at his side. Joe will go to college at Columbia and study engineering, becoming an expert in visual robotic technology that detects the slightest hint of irregular movement (the legacy of a childhood spent scanning the grass for lions). He’ll marry an American named Lulu and remain in New York, where he’ll invent a scanning device that becomes standard issue for crowd security. He and Lulu will buy a loft in Tribeca, where his grandfather’s hunting dagger will be displayed inside a cube of Plexiglas, directly under a skylight. It should not come as a surprise that, much later, we will meet Lulu once more, or that she will play an important (if unconscious) part in resolving an injustice that appears in the book’s earliest chapter (though not its first) and which no one seems to have noticed. James Fallows writes that Steve Zeoli’s recent Tinderbox piece is "Software Reviewing as it Should Be Done." One of my current favorites is (Mac-only) Tinderbox, whose creator, Mark Bernstein, was a guest blogger in this space recently. Steve Zeoli, of Vermont, has an extensive posting about Tinderbox at Mac Appstorm that is a model of how to both assess and explain a complicated piece of software. Even if you're not interested in Tinderbox, the review suggests some of the broader ways to think about what programs can and cannot do for you. I recently revisited the film of Howards End (currently streaming on Netflix), reminded by Ebert’s glowing review. It’s interesting how the reputations of Howards End and Galsworthy’s Forsyte trilogy have diverged. The first Forsyte volume, The Man Of Property, after all, is nearly the same date (Galsworthy 1906, Forster 1910), their underlying theme is not dissimilar, and both feature a pair of contrastingly strong women. The Man Of Property was, I think, once considered the better novel. Dirda steered me to this brilliantly readable and extensive biography of the British editor and critic of the Mitford-Waugh-Auden-Spender generation. Eton and Oxford, Connolly was a strange fish, an ardent homosexual who discovered women in early mid-life, adored them, had three wives and nearly always had a second woman nearby. He had wonderful taste in food and wine, adored the gentry, was always desperately short of money, and could never quite manage to make himself sit down and work. Still, he managed to create an important magazine, write several significant books, and to retain the friendship of the cadre of difficult men with whom be romped at school and who shaped the artistic taste of a generation. The centennial of John Erland Thorsen, Linda’s father. My father was born a hundred years ago today, on May 12, 1911 in Stockholm, Sweden. 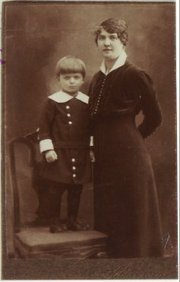 He never knew his father and was raised by his mother Karin and her family in the town of Norrköping. Often in conflict with his stepfather, who mistreated him, he went to sea at the age of 13, starting as a cabin boy. In the late 1930s John Erland landed in the United States where he was to spend the rest of his life. Like many immigrants to the U.S. he worked as a waiter. He was a perfectionist of sorts, and took great pride in the quality of his work. You can never make that crossing she made, for such Great Voyages in this world do not any more exist. But every day of your lives the miles of that voyage between that place and this one you cross. Every day. You understand me? In you that journey is. IN A WHARTON LOUNGE A LITTLE MORE THAN 50 YEARS AGO, a Swarthmore student named Ted Nelson tried to compose a difficult seminar paper. He was overflowing with ideas and awash in distractions, and e was intensely frustrated that these ideas could not be easily organized on paper. He wondered if the recently invented computer might play a role in solving the problem and sketched out some ideas for how a literary machine might facilitate better term papers, better libraries, and indeed a better repository for the world's documents. The pursuit of that idea changed the world. 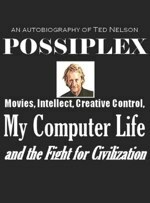 Read my discussion of Possiplex: Ted Nelson ’59 and the Literary Machine in the Swarthmore College Bulletin. In a Tinderbox Forum thread, Mark Anderson is offering Tinderbox training – either face to face in the UK, or through screen sharing and Skype anywhere in the world. If you’ve got challenging Tinderbox needs, or just want to sort through the use of agents and Tinderbox maps, he’s a terrific choice. An oddity of the Tinderbox 5.9 release has been the lack of much discussion of speed. Like lots of software tools today, Tinderbox finds itself in an economically interesting performance gap. Making loading-time faster generates substantial value for the community; it might only be a minute or two a day, but the value of a minute a day for a lot of users over the course of a year or two adds up to real money. But, while making Tinderbox faster generates collective wealth, there’s not a very good way for Eastgate to receive a return from its investment in the speed bump. In this case, faster saving was made desirable because automatic backup and autosave are much easier to implement if saving is likely to be unobtrusive. Fast loading is, pretty much, a gift. We could have thrown a big party at someplace like SxSW and bought you all some beer, but instead we spent the money on performance. Anyway, we hope you like it. Another interesting Tinderbox comment from Appstorm on using Tinderbox to plan novels and a trilogy. I have planned a trilogy of novels on it, and a detailed timeline for the first novel. I’m currently editing the first novel, which is to come out in February 2112, and I have set up my Scrivener screen so that the timeline occupies the lower third of my screen (though the Apps can be viewed together in other ways). I write using a 27″ cinema display running off a MacBook Pro, so this is a stunt that I can pull. As for the trilogy, the plan is a work in progress using map view. But the power to manipulate the characters, events and relationships, and run what-ifs, has far exceeded my expectations. As for the learning curve, my practice is to learn a new TB trick every week. Otherwise I’d go nuts. Learning TB is like learning a musical instrument. At a certain point the frustration dissolves and it feels just plain good. Then you take it up notch, etc. Here’s my prediction: for the rest of my life I will be using Scrivener and TB in tandem for all my novels. For many years, I have walked into large, complex businesses and attempted to identify what was going on and how it could be done better. My job was part Qualitative Research, part Quantitative Research, and part Political Analysis. Qualitative Research has a number of tools for analyzing interviews and playing with the data, teasing meaning out of diverse viewpoints. I used these tools effectively, but I wish I’d had Tinderbox earlier in my career because it would have made this job easier. Tinderbox is a far more useful tool for ‘right-brained’ qualitative analysis than most of the other tools I’ve worked with, but even that sells it short. You’re right that Tinderbox is a tool to help you see the big picture, but you’re wrong in thinking that analysis of this sort can’t help you. My own experience over many years of consulting with large companies was that the people who thought they had the ‘big picture’ were most often mistaken. The big picture often turns out to be more complex than many people think they see and more fluid than they realize. This is also the problem with many of the reviews I’ve read about Tinderbox. 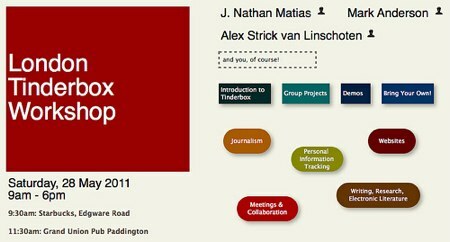 Tinderbox is often characterized by one or another of its capabilities, classified as a tool to do one thing or another. Very few people I’ve seen truly understand its character as a tool box for manipulating and exploring information. It’s as if someone handed them a toolbox loaded with tools, and they pulled out a hammer and described it as characteristic of the whole toolbox. I’m sorry to say that you have far more experience than I with Tinderbox. I only found it recently, but it’s displaced other research tools that only did part of what it does and I expect to find more things that I can do with it as time goes on. It’s a hard tool to master, that’s easy enough to see. It’s also a hard tool to characterize. If after several years you don’t find it useful, you probably never will, but don’t think it’s only for left-brained geeks, it’s useful for right-brained creative types as well who can see the ‘big picture’. The new Tinderbox 5.9 adds even more information to maps. Now, when you point to a note, you can have Tinderbox display a little extra information. 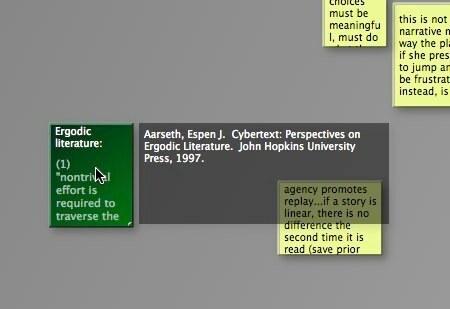 For example, here are some notes Stacey Mason made for her Hypertext 2011 workshop paper; pointing to a note reveals the citation. What is displayed? That’s up to you! The display is governed by a HoverExpression, which is just like DisplayExpression. You can display a fixed string, or construct it on the fly from other attributes. If you’re doing historical research, $HoverExpression might format the individual’s dates. If you’re plotting a novel, $HoverExpression might reveal character notes. There’s a bit of interesting detailing in the actual implementation. Hovering over a note doesn’t do anything immediately. Instead, it “arms” an automation that will proceed to reveal the hover panel if the animation isn’t cancelled first. Moving away doesn’t hide the panel, either, but begins an animation to remove it. if the map changes while the panel is visible – for example, if an agent changes the note you’re examining – the map is revised beneath the hover panel. And the hover panel itself is sufficiently opaque to make small print legible, while remaining translucent so you can know there’s something underneath. This might be overthought a bit, but we hope it’s going to help a bunch of people. A key concept for Getting Things Done is that one should try, at any given moment, to do the most urgent and important thing you can do right then. It’s always seemed to me that one ought also to try to do a lot, if only to give time’s winged chariot some exercise. Tinderbox dashboards have offered histograms for a while. The new Tinderbox 5.9, which will likely be available in a few hours, adds xyplots, too. 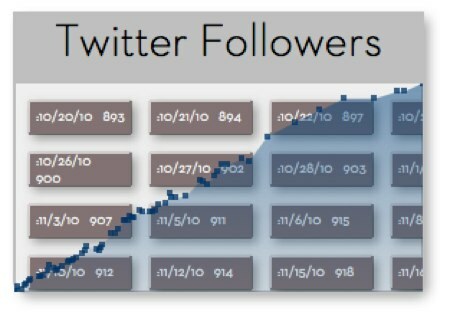 Histograms could substitute in charts like this if each entry were evenly spaces – if you checked your Twitter followers every day, for example. The new plot lets you specify both X and Y coordinates for each item. Any container or agent can have its own graph in seconds. We’re surrounded by liars and cheats. News on the Web is increasingly distorted to maximize page views and to mislead Google searches. Osama bin Laden is killed, and Mashable does a story on the Web angle. And another, and another, and another. All small, all slapdash, all stupid.